The court also granted bail to Darwin Prado, another Ladyville resident, but he remains in police custody since he was unable to post the required fifteen thousand dollars to be released. 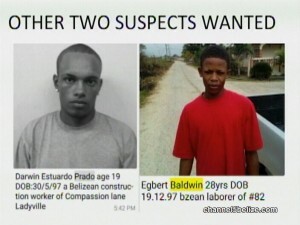 Last week, the teenager was one of two accused shooters arraigned in the Belize City Magistrate’s Court for attempts on the lives of Casey Lozano, Lyndon Gillett and Terrence Flowers Junior. And like Shane Bahadur, he will have to meet strident bail conditions. Prado was charged jointly with Egbert Baldwin for three counts of attempted murder, three counts of use of deadly means of harm upon Flowers Junior, Lozano and Gillett. They were also charged for using a firearm to cause grievously bodily harm, dangerous harm, grievous harm and wounding. Police investigations have since revealed that Prado was involved in a shooting spree on Marage Road, at the house of businesswoman, Cynthia Lozano during which Casey was shot and Lionel Rhamdas was killed though it is not yet m who shot Rhamdas. Prado and Baldwin are due back in court on August fifteenth, 2016.